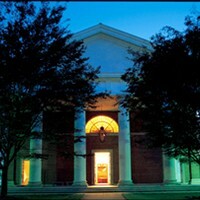 Sisters Chapel on the campus of Spelman College occasionally hosts performances of various types. Parking: For those using GPS navigation systems when traveling to Spelman, the following address will bring you directly to the entrance: 440 Westview Dr. SW, Atlanta, 30310. Upon your arrival, the public safety officers can inform you of where to park. MARTA: Exit the West End Station and head north on W. Whitehall St. toward Glenn St./Ralph David Abernathy Blvd. Turn left at Ralph David Abernathy Blvd. Turn right at Lee St. and then turn slight left onto Westview Dr. to arrive at the main entrance to campus.